The debate over how best to halt the movement of Asian carp and other invasive species between the Great Lakes and Mississippi River basin will likely reach a fever pitch in the coming weeks. The Chicago Waterway System, built in the late 1800s, is a network of canals that created an unnatural link between Lake Michigan and the Mississippi River basin; it is also the pipeline through which Asian carp and other invasive species move between the Mississippi River and Great Lakes basins. The study by the Great Lakes Commission and Great Lakes and St. Lawrence Cities Initiative — which cost $2 million and was completed in just 14 months — provided three options for separating Lake Michigan from the Mississippi River basin. Most importantly, the study showed that separating the two basins could be achieved without causing flooding in Chicago or harming the regional economy. The Great Lakes Commission study provided three options for separating Lake Michigan from the Mississippi River basin. Separating Lake Michigan from the Chicago Waterway System and the Mississippi River basin would cost between $3 billion and $9.5 billion and take at least a decade to complete, according to the study. But let’s not forget what’s at stake. Asian carp could decimate a Great Lakes fishery (worth $7 billion ANNUALLY), strike a blow at the region’s recreational boating industry (worth $16 billion ANNUALLY) and create potentially deadly hazards for millions of boaters. Keeping Asian carp out of the Great Lakes will take a Herculean effort by many government agencies. But it is clearly a war worth fighting. Allowing Asian carp to invade the Great Lakes would cost far more than preventing this ecological disaster. Scientists have concluded that separating the Great Lakes from the Mississippi River basin is the only permanent solution to the invasive species crisis that is wreaking havoc on both of these massive ecosystems. It’s important to note that the Great Lakes Commission produced its study in 14 months. The U.S. Army Corps Engineer’s study of how best to keep Asian carp in the Mississippi and Illinois rivers from invading Lake Michigan won’t be completed until late 2015, at the earliest. The timeline for the Army Corps study is simply unacceptable. It took the United States four years to win World War II and a decade to put a man on the moon. At its current pace, the Army Corps will take at least eight years — from the time Congress authorized the Asian carp study — to propose solutions; implementing a solution will take several more years. Asian carp could be spreading throughout the Great Lakes by the time the Army Corps proposes a permanent solution. The Chicago Waterway System created an unnatural link between Lake Michigan and the Mississippi River basin. In light of the Great Lakes Commission’s game-changing study, now seems like a good time to review the Asian carp’s steady march toward the Great Lakes. Below is a timeline of the Asian carp story. Much of the information in this timeline was culled from a series of articles written by Dan Egan of the Milwaukee Journal-Sentinel. Egan’s outstanding work brought the Asian carp crisis to the nation’s attention and he continues to break news about the U.S. Army Corps of Engineers questionable handling of this looming ecological disaster. 1963: The U.S. Fish and Wildlife Service imports grass carp from Malaysia to a federal research facility in Arkansas. 1966: First believed escape of Asian carp into U.S. waters, in Arkansas. 1970: State of Arkansas begins stocking grass carp in weed-choked waters throughout the state. 1973: An Arkansas fish farmer who ordered the first commercial import of grass carp from Taiwan unintentionally receives the nation’s first shipment of bighead, silver and black carp. 1974: The Arkansas Fish and Game Commission agrees to take the bighead, silver and black carp from the fish farmer who mistakenly received the fish from Taiwan. The state begins breeding the fish and reports it stocked more than 380,000 grass carp in Arkansas waters. 1979: Arkansas Game and Fish, with a grant from the U.S. Environmental Protection Agency, begins using silver and bighead carp in sewage treatment experiments. 1980: The first report of silver carp swimming in the wild. Early 1990s: Flooding allows silver and bighead carp in Arkansas fish farms to escape into the Mississippi River. 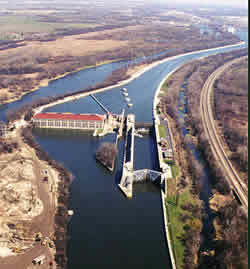 2002: Electric fish barrier is installed in the Chicago Sanitary and Ship Canal, about 25 miles from where the Chicago River connects with Lake Michigan. The barrier was originally built to prevent round gobies in Lake Michigan from migrating into the Mississippi River basin via the Chicago canal system. Gobies breached the barrier before it was completed, so government officials opted to use it to stop the northerly migration of Asian carp. Late 2002: Biologists find Asian carp 21 miles downstream of the experimental fish barrier, roughly 45 miles from the Lake Michigan shoreline in Chicago. 2003: After a common carp is tracked swimming through the electric fish barrier, operators increase the voltage. The barrier then fails for 25 hours, but government officials doubt that any Asian carp passed through it during the power outage. 2007: Congress directs the Army Corps of Engineers to find ways to halt the movement of Asian carp and other invasive species between the Mississippi River and Great Lakes basins. Three years passes before the Army Corps begins the study. November 2008: A study commissioned by the Alliance for the Great Lakes concludes that hydrologic separation of Lake Michigan from the Chicago Waterway System and Mississippi River basin is technically feasible. November 2009: The Army Corps of Engineers discloses that 32 positive samples of Asian carp DNA were found beyond the electric fish barrier; some were found within nine miles of Lake Michigan. In response to those findings, National Wildlife Federation and other conservation groups call for permanent separation of Lake Michigan from the Mississippi River basin. January 2010: The U.S. Supreme Court rejects Michigan’s request for a preliminary injunction that would have forced the closure of locks in the Chicago Waterway System to prevent Asian carp from reaching Lake Michigan. Hours later, the Corps of Engineers announces it has found Asian carp DNA in waters connected to Lake Michigan. June 2010: Federal officials rule out closing locks in the Chicago Waterway System to prevent Asian carp from reaching Lake Michigan. That same month, one live bighead carp was found in Lake Calumet, which is several miles south of Lake Michigan but directly connected to it. February 2010: President Obama pledges $78 million to prevent Asian carp in the Mississippi River and Chicago Waterway System from invading the Great Lakes. April 2010: The U.S. Supreme Court refuses to hear a request to permanently separate the Great Lakes from the Mississippi River to prevent the movement of Asian carp and other harmful aquatic invasive species between the two basins. The attorneys general of Michigan, Wisconsin, Minnesota, Ohio and New York filed the case. July 2010: Asian carp are found in Indiana’s Wabash River, a few miles from where the Wabash often floods and flows into the Maumee River, a major tributary of Lake Erie. December 2010: The Corps of Engineers launches its Great Lakes and Mississippi River Interbasin Study, known as GLMRIS. The agency announces that the study of how to keep Asian carp and other invasive species from moving between the Mississippi River and Great Lakes basins will be completed in 2015. Conservation groups and some members of Congress call on the Army Corps to complete the study within 18 months, but the agency refuses to alter its timeline. March 2011: The Corps of Engineers acknowledges that the electric barrier in the Chicago Waterway system doesn’t repel all sizes of Asian carp. June 2011: A group of prominent scientists, after concluding that an Asian carp invasion of the Great Lakes is imminent, calls for the hydrologic separation of the Great Lakes and Mississippi River basins. July 2011: For the third time in 2011, the Corps of Engineers finds Asian carp DNA in Lake Calumet, which is directly connected to Lake Michigan. December 2011: A Corps of Engineers study reveals that the volume of cargo hauled on the Chicago Waterway System decreased by nearly 50 percent between 1994 and 2009. The study discredits the claim that separating the Lake Michigan from the Chicago Waterway System — to halt the movement of Asian carp and other invasive species between the Mississippi River and Great Lakes basins — will devastate Chicago’s economy. Go here for more study details. January 2012: The U.S. Geological Survey concludes that three of Ohio’s largest rivers — the Maumee, Sandusky and Grand — provide suitable habitat for Asian carp, which could allow the fish to establish a reproducing population in western Lake Erie. January 2012: The study by the Great Lakes Commission and the Great Lakes and St. Lawrence Cities Initiative provides three options for creating a permanent hydrologic barrier between Lake Michigan and the Mississippi River basin. Building the barriers would cost between $3 billion and $9 billion and take at least a decade to complete, according to the study.